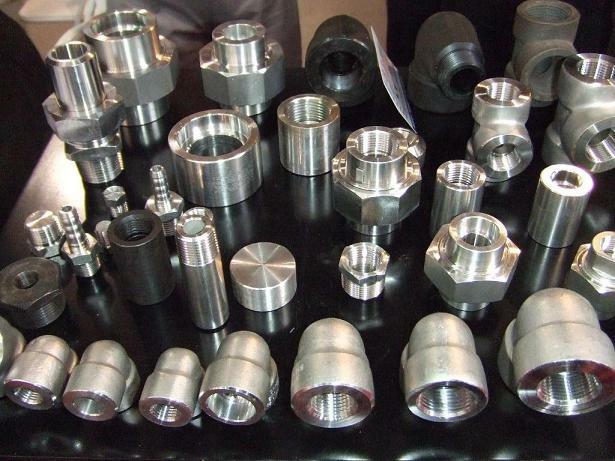 Definition: With the booming development of modern industry, pipe fittings are widely applied in almost all the industries as the connector for pipes, especially for mining industry, oil& gas industry, chemical machinery, shipbuilding industry, ect. Such fittings include: elbow (45°&90°), tee, cross, cap, half coupling, coupling, and so on. Alll these forged fittings must withstand high pressure, so we call them high pressure forged fittings. Materials: Due to the corrosion resistance and rustless of stainless steel, so it is commonly adopted for manufacturing forged fittings. Main material specifications are SS304 and SS316. Besides, there also exsits another carbon steel material (A105) used in the production of forged fittings. Although there are a number of forged fittings used in different specifications, to standardized them, we distinguish them from size 1/8" to 4" (DN6-DN100). And according to their specific usage, there are divided into threaded fittings and socket-weld fittings. Drop forging could produce high pressure fittings in net shapes with less machining, so we could get fittings with good surface finish in a cost-effective way. Those high pressure fittings after forging will have better mechanical properties than casting, as internal grain structure formed after forging. Normally, the demands of forged fittings are large, so it will be economic for large production runs. As the largest manufacturer and exporter of high pressure foged fittings in China, we could make all the fittings according to the American standard OEM part numbers. Of course, it is also workable for us to custom forged steel fittings according to your drawings or sample. Owing to our superior quality and competitive price, our products are well exported to overseas market, like USA, Australia, UK, Brazil, ect.